OSWEGO, NY – The Oswego City School District is “Driving Books Homes” this summer with the help of a bookmobile. 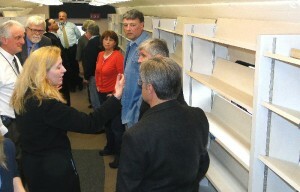 Members of the school board and other district officials get a look inside the bookmobile at a recent committee meeting. A drive is under way to get books to stock the shelves. Throughout the district, books are being collected to help stock the new vehicle. 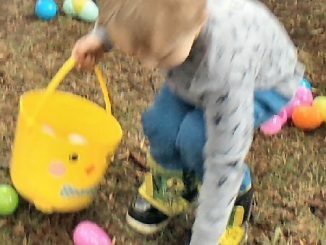 Books (age appropriate for Pre-K – 12th grade) can be donated at the YMCA, river’s end book store and the public library. The goal of the program is to encourage youngsters to continue reading over the summer so they don’t lose the skills they learned in school, according to Joan Dain, a reading – writing teacher in the school district. Driving Books Homes is a cooperative effort between the district, the Oswego YMCA and SUNY Oswego. It grew out of last year’s Oswego Reads program, Dain said. The United Way and Literacy Volunteers are also looking to be a partner as well and the library staff is assisting with the book drive, added Deana Masuicca, director of the YMCA. The YMCA actually owns the vehicle. There will always be two people on board the bookmobile. Dain said she, with the assistance of Terri Delahunt-Daino, put together grants that helped with the purchase of the bookmobile. The vehicle will be 100 percent sponsored and/or grant funded, Masuicca pointed out. Bill Myer of the district’s transportation department did a wonderful job of inspecting the vehicle to determine if the Y should acquire it, Dain noted. Some of the possible sites the bookmobile will visit include the YMCA, Scriba Town Recreation, Fort Ontario Park and the Oswego Farmers’ Market, Dain noted. “You can commit a couple of hours to the project or several hours though the summer,” Masuicca noted. They will have the bookmobile in the Fourth of July parade and the program will get under way that Tuesday, July 5, she said. They encourage people to come and read some of their favorite children’s books to the youngsters this summer. They also hope that when the bookmobile returns to a site that the youngsters will want to talk about some if the books they read the last time, Dain said. “Kind of like a tiny book club where the kids can talk about their favorite books and share,” Masuicca added. The program has a few sponsors already and more are likely to climb aboard this summer, Dain said. Pathfinder Bank and Entergy are two of the main sponsors currently. Fastrac is assisting with gas for the vehicle. The vehicle was made down South by a company that manufactures bookmobiles and bloodmobiles. It is about 10 years old. They plan to bring the bookmobile around to the district’s seven schools in June to acquaint the students with it. Organizers said they would like to see the bookmobile on the road all eight weeks of summer. The official unveiling is tentatively set, “if all goes well,” for 5 p.m., May 31, at the Oswego YMCA, Dain said. “The beauty of it is this collaborative nature, the pulling together of the great resources we have here in our community to do a wonderful things for kids. School districts have a lot of issues, a lot of things to address and in my opinion, they can’t do it alone. The community really needs to help. I know we can do it; this is an example. It really does make a difference,” she said.